09 Apr Does Your Dog Need A Yard? My mothers response was always the same “Dogs need a yard!” And so I had hamsters and guinea pigs, but no dogs during my childhood. Having a yard is still a big topic in dog ownership these days. Some rescue organizations require potential adopters to have a fenced-in yard these days in order to qualify to adopt a dog. I have met several great families who were turned down by the rescuers because they did not have that yard. Is a yard a requirement – or just a nice to have? Do dogs really need a yard – and if yes, for what exactly? Let’s look at some reasons a yard might be beneficial (and why I still don’t think it’s a necessity). Dogs are the only type of pet that is expected to consistently go to the bathroom outside. It speaks for their incredible success in domestication and adaption to our lives that we don’t question a healthy adult dog’s ability to potty outside when him take them there, and hold it inside. No one would expect the same from a hamster, bird or even a cat – we accept that their bathroom habits will require us to deal with their toilets inside our house in some way. Dogs are astonishing in their learning capabilities, and with consistent potty training most 6 month old puppies can already understand where to go and be reasonably clean inside the house. During the potty training phase however, regularly taking the dog outside is a must. 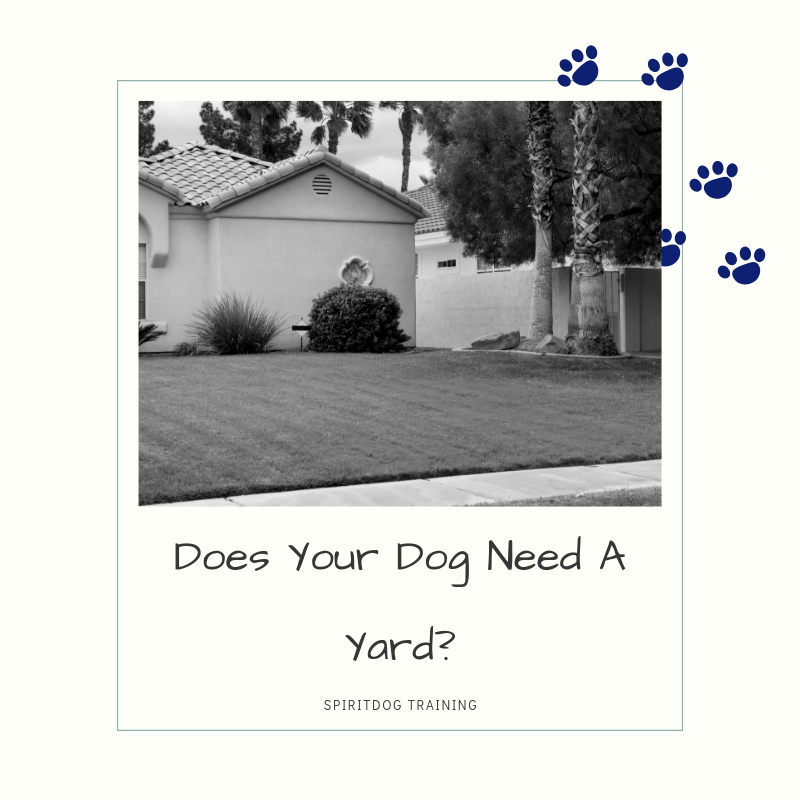 This is many, many times easier if you have a safely fenced and convenient yard behind your house than if you have to leash up your dog and take it for a walk down the road – every 20 minuted if your puppy is awake and has a small puppy bladder. One of my childhood friends was able to convince her parents to get her a Dachshund even though they lived in a smaller space than we did – and on the 6th floor (with no elevator) to boot! After a few weeks the puppy – somehow! – was perfectly potty-trained and had no accidents in the house from then on. I am still thinking about the dozen times the parents ran up and down the six flights of stairs with the puppy in their arms every day, to make it down in time. They will forever hold the place of the most committed potty trainers in my book. But even if you just live on the first or second floor, the convenience of a yard is nice. Not having to put a leash on the puppy and a coat and shoes on yourself in the middle of the night is extra nice. My middle dog Kix has grown up to have the most stealth bladder of all my dogs. She would probably not have an issue with holding it for 24 straight hours (I have of course never tried that out. I walk mine several times a day so the longest she goes in between potty opportunities is probably 5 hours. ) Since she has been an adult dog I have not once seen her urgent to go. She will frequently choose to first play or do agility, and only potty after if there is absolutely nothing else fun to do. When she was a puppy however…things were a bit different. It appeared she had a bladder the size of a grape (a small grape). Where I recommend to clients to take their dogs out every 20 minutes, she had to go at least every 10 minutes. Playing with puppy Kix went like this: Kix woke up and we went outside to potty. I got a toy and we played for a few minutes before going outside to potty again. We practiced some puppy tricks and back outside we went. During the night she would wake me up 3-4 times to go out until she was 7 or 8 months old. I spent a lot of time putting my shoes on, leashing her up and walking to her potty area in front of our house. I really wanted that yard! Now that she is all grown up and my next puppy is also nearly a year old, not having a real yard for pottying does not have any impact. I take them on walks anyway and they will easily go for the few hours in between. For a young dog though having a yard is a huge advantage! This one is a big topic. It is what my mum was referring to with her “a dog needs a yard” rule – that dogs need to run and play outside as much as possible. I do agree with that general sentiment. However there are so many possibilities to exercise a dog without any yard at all. In my work as a dog trainer I have in fact noticed that the vast majority of dogs that show reactivity towards dogs and/or humans have a lovely big yard. They can play and run all they want in there. Here is where a self-reinforcing cycle can begin: Maybe one day their owner took them out to the park. The dog snarled and lunged at another dog, the owner got scared by his reaction and decided that the dog could have the same amount of exercise in the yard – but much safer! We know that exposure is hugely beneficial in dogs with reactivity. Exposure is easy to avoid when the dog has a huge yard. On the other hand, exposure is a given for dogs that live in an apartment and need to go out multiple times a day to potty or to go for a walk. Nearly every apartment dog I have met is well-adapted and calm around humans and other dogs. (This is to be taken with a grain of salt. I am certain that there is some bias to this observation. If an apartment dog was to be fairly reactive, the decision to not keep that dog might come quicker and the reactive apartment dog gets rehomed and becomes a reactive non-apartment dog. On the other hand, a reactive dog is easier to keep in a house with a property that he does not have to leave. When my dog Fusion was an only dog 5 years ago, we briefly lived in a house with 1 acre of beautiful meadow around it. I was wonderful to be able to give him little bursts of exercise throughout the day without having to leash up and head out to the park. To roll out in one’s pajamas with a cup of coffee and play some Frisbee Games right off the porch is a luxury I miss at times. If you combine in-yard and out-of-the-yard exercise and playtime, a yard is a great addition and opportunity to make the most out of playing with your dog, especially if you have little time. The #1 call I get as a dog trainer is not to assist with leash pulling or aggressive behavior – it is to help with potty training puppies. Every couple days I see a family that recently got a young dog who is now struggling with the concept of going to the bathroom outside. Every single one of these cases is usually much easier to solve when there is a yard available, or at least a potty space in close vicinity to the living area. Young dogs have to go to the bathroom a lot. As mentioned above, I usually advise to offer them to potty every 20 minutes that they are awake, AND after peeing, sleeping and eating. This quickly adds up to a dozen or so bathroom breaks a day for a young puppy. Putting on shoes and a jacket, taking the leash and getting the puppy outside on time for every one of these times can be…time-consuming (or, as many of my clients rightfully put it: “a full-time job”). Everyone who is potty-training a puppy without a yard deserves a medal. Dogs that are very energetic and have a lot of time to kill in the yard can develop obsessive behaviors that are very hard to fix. As long as dogs are able to calmly spend their time in the yard sniffing or lying in the sun, it is a great place to be. Unfortunately the many stimuli of a yard can also encourage a range of OCD behaviors in our dogs – much more than in a house. These behaviors ranges from the fairly well-known fence running over obsessive digging to staring at little dust and light particles. I met one Border Collie who had adapted the habit of lying under a bush for 8+ hours a day, staring at the ground and waiting for the tiniest bit of wind to move little sand particles which he would then fiercely observe. Others start to chase (“herd”) clouds in the sky or bark incessantly at every dog or person walking by. It is probably clear that this is neither a normal nor a healthy behavior. It puts the dog into an unnecessarily aroused state (there is some Trouble with Excitement) and has the potential to intensify over time until the dog values nothing as highly as indulging in his strange little hobby. At this point even training and playing with the dog might become an issue, as he would rather obsess about another shadow than learn a new trick, practice his obedience or participate in a game of tug-of-war with you. I have quite often suggested to owners with a dog that exhibited these behaviors – and with a lovely big yard – that their dogs needs more “boring” time inside without the stimuli that set him off. Otherwise he may spiral more and more out of control which will not be pleasant for neither him nor you. If you do have a yard and a dog who spends a lot of time out there, be on the lookout for the beginnings of potential obsessive behaviors. The earlier you can catch them, the faster and more successful will the remedy be! A yard can make life with dogs much easier, especially in regards to potty training and spontaneous exercise. However it is not a requirement for dog ownership in my eyes. Rescue organizations may unknowingly turns down fantastic homes just due to the absence of a yard, which is a loss for everyone – the dog, the rescuers and the potential adopters. With some planning of enrichment and exercise it is absolutely possible to have your dog lead a happy, fulfilled life without a yard. Listen to your individual dog and find out what he needs – a high energy dog may be overstimulated by staying in the yard for long hours and might do better if he has scheduled breaks inside. Don’t forget that mental exercise (such as Brain Games) is a valuable way of enrichment as well that no yard can provide.